A kitchen utensil with an open-celled texture that is semi-hard when dry or soft and porous when wet. With each cell being open to the next cell, it effectively absorbs excess materials on surfaces to wipe away or clean the materials spilled or remaining. In earlier years, Sponges were harvested from ocean waters where they existed as living organisms. Today, synthetic materials have replaced the ocean Sponges and are now commonly produced in a variety of sizes, shapes and textures to be used in kitchens, for baths, or for general cleaning purposes. One of the main concerns with the use of Sponges is the bacteria that can remain within the pores of the Sponge if it is not cleaned and maintained properly. Since Sponges are used for a wide variety of wiping tasks, the possiblity of contaminating the Sponge is high. As an example, if frozen or fresh uncooked meats are defrosted or laid on the counter and a Sponge is used to clean some of the dripped residue or the location where the meat may have been placed, the Sponge then may contain bacteria such as E. coli and salmonella organisms that could cross-contaminate other foods. Therefore, it is wise to consider options for various cleaning tasks, such as only using the Sponge for certain tasks and using paper toweling for other wiping chores. Or assign different colored Sponges to different tasks, such a specific colors for food, dishes, floors, and various other chores or locations. 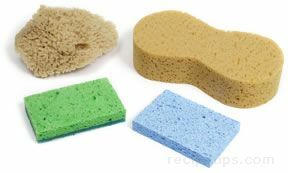 It is important to realize that damp and/or dirty Sponges can always retain bacteria as well as begin to emit bad odors so it is wise to clean and disinfect Sponges whenever necessary. Daily cleaning is best accomplished by rinsing out the soap within the Sponge after each use. Hold the Sponge under hot running water and then allow it to air dry fully by using a dish rack or similar so air reaches all sides of the Sponge. Allow it to dry completely before using it again. To clean it more thoroughly, place the Sponge in the dishwasher, inserting it in the tray that holds forks and spoons or place it in a microwave and heat it on high for two minutes. Either the dishwasher or the microwave procedure, which exposes the Sponge to higher temperatures, should effectively disinfect and remove bacterial growth. Keeping Sponges for 1 month or a little longer before throwing them away is a good rule for keeping Sponges sanitary and well maintained. Similarly, when a Sponge begins to show excessive wear or if it is unable to absorb spilled foods and liquids, it is time to replace the Sponge. Sponges are available in many different shapes, sizes and pore (hole) configurations. Larger pores and thicker Sponges are best for larger wiping and cleaning tasks such as floors, stoves and larger sized appliances. 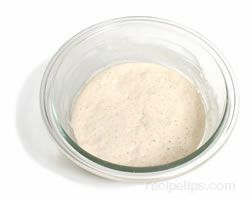 Smaller pores work well for pots, pans and everyday utensils. 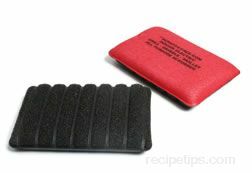 Some Sponges have a harder scrubbing layer (cleaning pad) adhered to the surface of one side of the Sponge, so tougher cleaning tasks can be accomplished easier than by simply using the softer side of the Sponge. Similarly, some Sponges are made with nylon layers that work well with pots and pans having coated surfaces to not only gently clean surface areas but also to thoroughly clean areas built up with hardened materials, such as food particles cooked onto the surface of the pan. When selecting Sponges, always consider the task desired and choose a Sponge that fits the needs and can be assigned specifically to the job intended.